Written by Eric Yost and Corey Ross, Suburban Brewing Co. Warm weather, the tastes of BBQ and grilling call for a specific kind of beer. There’s not much better than the backyard rite of spring—dusting off the grill and doing some early season outdoor cooking while enjoying a nice light refreshing beer. As the sun sets later and the temps move higher, many beer fans find their tastes shift to lighter beers. The beers of spring are a refreshing change of pace from the big winter beer styles we craved as true winter warmers. We believe there’s a beer for every occasion and a beer for every season. That’s especially true as the seasons move to warmer weather when a cool brew is much appreciated. Here are some favorites. Belgian Witbier from Locust Lane Craft Brewery. Beers that immediately come to mind for spring sipping are pilsners, helles lagers, kolschs, German wheats, American wheats, cream ales, goses, Belgian witbiers and saisons, to name a few. They all fit the bill for those springtime endeavors on the back deck or patio. These beers tend to be on the lower end of the alcohol range, usually around 4.5% to 5.5% ABV (alcohol by volume) and are light in body with a nice balance between malt and hops. This allows these lighter colored beers to drink extremely easily. Plus their usual golden and straw color are not at all intimidating. In fact, they’re downright welcoming to newbie beer fans. One reason these beers are perfect for the season is that they tend to be very sessionable and extremely thirst quenching. When we say sessionable, that means the lower alcohol content leaves the drinker able to operate a charcoal or propane grill while enjoying two … or three. Another reason these beers are particularly popular in spring is how well they pair with grilled food and side dishes that go with those main courses. While you may find your own preferred pairing—and we urge you to experiment widely and often—here are a few of ours to sip. Try, for example, saisons. Saisons originated in Belgium and were brewed during the farming season with ingredients right from the farm. As a style, saisons can be very diverse in terms of alcohol percentage, flavor, aroma and color, which makes them the Swiss Army beer to pair with food. Flavor characteristics for saisons can range from peppery to fruity and from sour to dry. This wide range in tastes comes from the strain of yeast used to brew the beer. Pairing a peppery saison with a grilled chicken dish or even with grilled veggies, like asparagus, is a surefire hit at any backyard BBQ or Sunday night dinner on the deck. While saisons may be a bit more complex in terms of flavor profile, lagers are a tried-and-true beer style for any outdoor cooking session. A nice clean tasting helles lager—from the German word hell, meaning bright, light, pale and for a beer that’s less hoppy than pilsner—will pair perfectly with a grilled pork tenderloin or even grilled seafood. You can also substitute a kolsch or any other type of light, malty and slightly sweet lager or German ale. A few more words about kolsch. This beer is fermented with ale yeast, then finished with lagering. Some call it the best of both worlds (of the major division in the beer world between ales and lagers). This light, easy drinking option has a clean, crisp finish, for a satisfying taste. Another beer style that fits well with almost anything grilled is wheat beers. We’re going to lump German and American wheat beers together even though they are fairly different in style and only share the same “wheat” name. Try Suburban’s Double Dog Dare You with their Copy Cat kolsch. 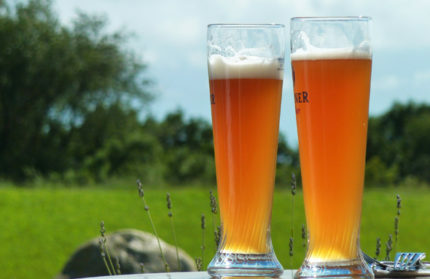 German wheat beer is a classic style that has a banana and clove flavor profile. The German wheat also has a lighter mouthfeel and is the original style for the hazy looking ale from the yeast that’s still in suspension. German wheats complement grilled seafood and salmon as well as side salads that contain goat cheeses or other soft cheeses—perfect warm weather menu choices. The American wheat beer style more closely resembles the American pale ale style that’s hoppier and has less emphasis on yeast character, compared to its German counterpart. American wheat beers pair nicely with BBQ chicken and even big juicy hamburgers, but they’ll also work well with any dish that has BBQ sauce or some spice and heat. 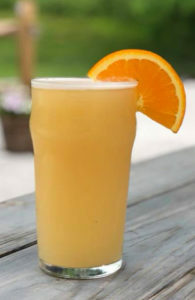 Earlier in this article, we mentioned cream ales (no cream, but one of the best beers you’re not drinking), goses (sour wheat beers) and Belgian witbiers (literally, white beer, an unfiltered, cloudy pale ale spiced, generally with coriander, and orange peel), but we’ll leave them for you to create your favorite pairings. A great thing about the current state of craft beer is there are so many beers, especially locally, that don’t fit a classic style by definition but are perfect in terms of drinkability as a springtime beer. So we urge you to explore the wide world of local craft beer. But with that said, there’s also something about getting back to basics with classic styles and pairing them with delicious food. There’s a reason some styles have been around a long time and are considered classics. Sometimes keeping things simple just works. We suggest you talk to local brewers and ask for recommendations for pairing their beers with their menu. You know the dishes were chosen with pairing in mind. Some menus make it easy for you and print a suggested pairing. 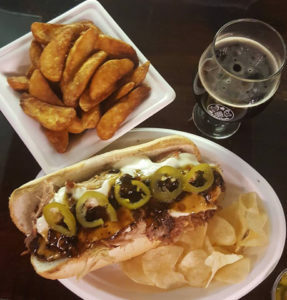 If you visit Suburban Brewing, we’d recommend you combine our Double Dog Dare You—a hot dog with pulled pork, hop cheddar cheese, bacon jam and pickled jalapenos (see photo on the prior page)—with our Copy Cat kolsch. The DDDY might not be simple, but, boy, it really works with the classic style of the kolsch! So whether you choose to keep it simple or go all out with your exploration of food and beer pairings, finding that perfect match is well worth some of your time this spring. Cheers! Corey Ross is co-owner of Suburban Brewing in Honey Brook and owner of Fancy Camper Home Brew Supply in Malvern. He started his brewing journey in the mid ‘90s working at a brew-on-premise microbrewery and has continued home brewing ever since, now combined with his new venture at a small batch brewery with Eric Yost. A native of Chester County, Eric Yost developed a respect for using fresh locally sourced ingredients while honing his skills around the country and at local restaurants, including White Dog Café and Wyebrook Farm. Now chef and owner of Suburban Restaurant and Beer Garden in Exton, he co-owns and operates Suburban Brewing with Corey Ross. Podcast: Is new craft beer worth the wait?